I agree with Schrompf, and: can you leave the cockpit if you're on manual steering (the Kerbal mode)? Haha, okay then, but manual steering plus trying to leave the cockpit should pop up a warning of some kind then! Either that, or I'll make it so you have to hold down the button before it moves you to the back. And/or an animation that you can interrupt. I'm having a bit of a conflict in my head right now. In the future, I'll inevitably be making some of the more special secret weird stuff that there is to find out in space, and would love to document its creation. But at the same time, that's basically just a big fat pot of spoilers, and I wouldn't want to remove the element of surprise of people discovering that such things are in the game in the first place. So I'm not quite sure what to do - hold it in? Post it anyway? Or some sort of compromise, some off-site documentation, linked with a big spoiler warning? I'm not sure which feels best. Amount of people reading here <<< Amount of people playing your game. Hopefully. So talk about whatever you want. Yeah, you're probably right. I know I tend to get a bit too worried about this stuff sometimes. Actually, you know what? I'll just get it out of the way so I don't have an excuse to worry afterward. I plan on eventually making very rare megastructures that you can find - such as ringworlds, o'neill cylinders, that sort of fun stuff. Big Dumb Objects, they're often known as. The physics should already work out, and it's mostly just a matter of figuring out how to beat up my terrain generator and atmosphere shader enough to build them. I actually know exactly what I need to do to the terrain generator for that much, but generating things like massive walls and the underside etc remain elusive. I started working on object interaction today. You can pick up and carry things, then finely position them with the mouse, and rotate them with the same controls you use to rotate your ship (WS/AD/QE). I'm not 100% sure on this control scheme, but it feels very natural after controlling the ship in the same manner to me at least. Time for another talky post. This one won't be as long. No pictures this time either, as it's all totally future stuff. Many sorries. I've been doing some thinking and talking about how things can go wrong in the game. I still stand by there being nothing in the way of combat, but there will be consequences for mistreating your spacecraft. While it may be constructed of high-grade super-cool Space Metal™, and protected with neutral-boson repulsor pixie dust shielding, it's not invincible. A hard enough impact can damage or destroy it. Destroying it is the less interesting of the two options, so let's talk about what happens when you damage it. The current line of thinking is that upon a sufficiently violent impact, parts of your ship can break in various ways, with various effects. One or more engines might cut out, leaving you with reduced thrust. Your hyperdrive nacelles might get bent out of alignment, sending you veering off course the next time you try to drop into hyperspace. Your landing gear may jam, your HUD may glitch out, and so on. While your ship does have some auto-repair functionality, it can't do everything. So when something does break, you need to go back into the engineering section and get your hands dirty. You'll have to find the broken piece inside the component in question, pull it out and dispose of it (either dereplicating it, or putting it on a bookshelf as a memento), replicate a new replacement, and reinstall it. In addition to direct abuse of your poor spacecraft, it also will wear over time. The harder you push your engines and drive, the more wear they will experience. Eventually, they might start sounding strange, you might get odd shudders during your hyperspace jumps, or the gear will audibly strain. Eventually, too much wear, and the parts will break, with the same result as breaking them more directly. You can catch wear-related failures before they happen, though, by keeping an eye and ear out for the symptoms, and replacing the parts before they fail. Now, let me be very clear - these features are optional. If you don't wanna deal with them, that's fine! They can be turned off! My rationale for adding them, though, is to help the player feel more connected to their spacecraft - crawling around in its guts, experiencing its idiosyncrasies, hoping it will hold on just that little bit longer in hyperspace before that damn #4 nacelle gives out. And so on. I see the chemical symbol displayed quite prominently on the box... Will elements play an important role in your game? Oh, no, this is just a joke prop I made years ago that I brought back as my standard test unit. I'll probably hide it in the game somewhere, though. And here's another gif. Slower so you can savor it better. I'd say this effect is basically done now. Some people tell me I have a habit of getting my priorities mixed up when making things. Those people are completely correct. Lighting is very temporary, of course. Sooner or later I'll start messing with global illumination for the interior space. On an unrelated note, I woke up at 00:30 and it is now 19:00. I may be losing my mind. 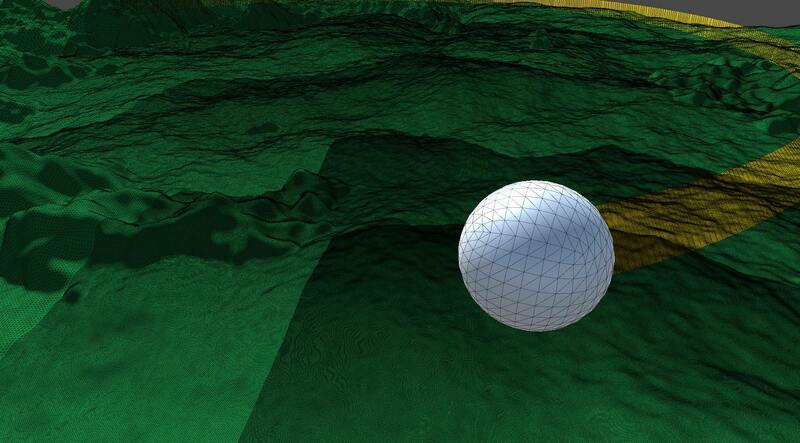 I'm curious if there are any other icosahedral/tri-based terrain systems out there. Usually I just see people working with quads and quadtrees and such. I've had a lot of experiences with quads, but I'm finding I like tris a lot better. This system is definitely going to go further than just one game. Still kicking terrain generation around. 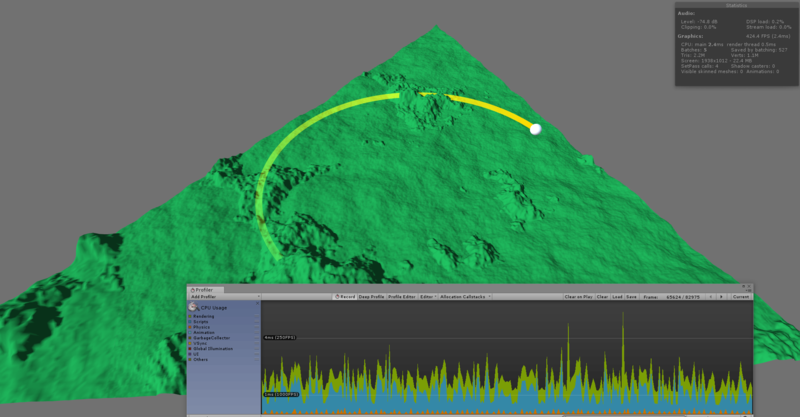 Here's another quick gif, showing tracking of changes between chunks. This one's done on the CPU instead of the GPU. 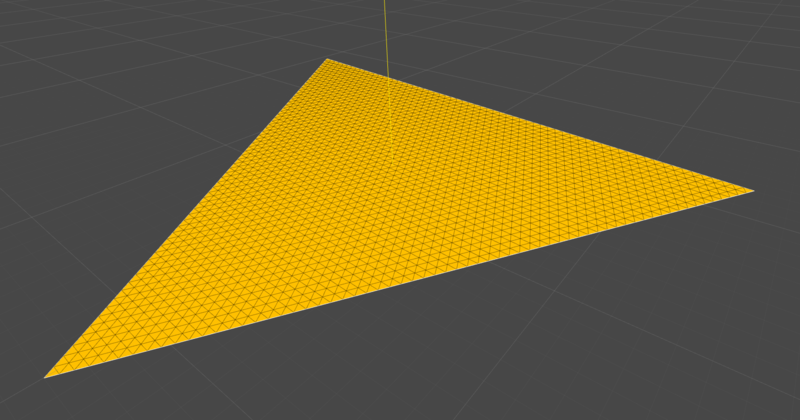 Also doesn't have the bifurcating triangles yet. Later on I'm going to make a massive and comprehensive post documenting the entire demented rollercoaster I've been on as I try to work out the proverbial Better Way to do all of this. Been doing some stress testing with my new terrian generator. The sphere is set as the sample position for it, and the sphere is moving quite quickly in a circle to see how much rapid movement impacts performance. The answer is, mercifully, not much! 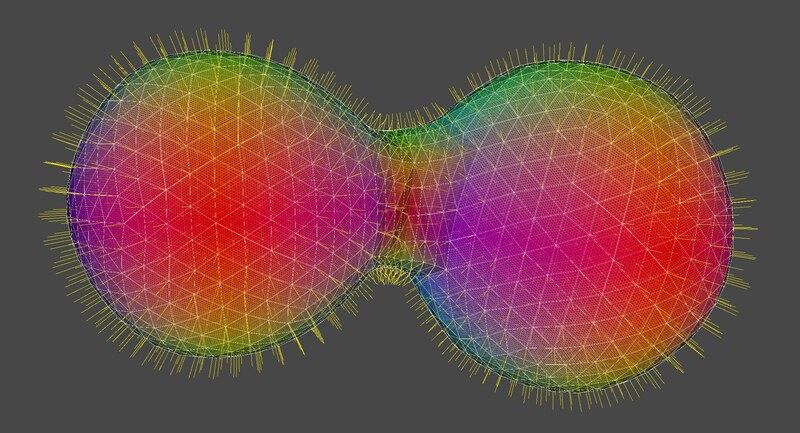 I think it would be moving at an equivalent speed of 10-20 km/s if the big triangle is the ~50 km size that the ones in game would be. 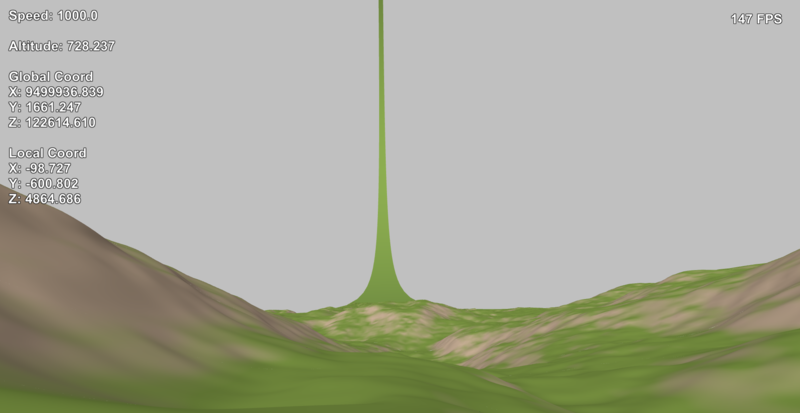 Soon will come the time of the Big Terrain Dev Post, although it probably will be a bit smaller than I had hoped. I do not feel like digging through to try to remember all the twists and turns it's been. Terrain looks good. Interested to read since wish to implement.